Maid SailorsBlogCleaning TipsMagic Erasers: How Do They Work and How Can You Use Them? If you’ve ever used a “magic eraser” around your home, then you know just how effective they can be in removing stains, dirt, and grime from all kinds of surfaces. But have you ever taken the time to really consider how these amazing little sponges work? By having a better understanding of how magic erasers work and the best ways to use them, you can make the most of your purchase. How Does A Magic Eraser Work? Magic eraser sponges are made of melamine foam. Interestingly enough, this foam was first used as a sound-proofing material and insulation. It wasn’t until decades after its application here that it was discovered just how effective it was at removing scuffs and stains. Specifically, melamine foam particles have an extremely strong microstructure. The foam is also abrasive, so when you scrub it along a surface, it’s like using an extremely fine piece of sandpaper to remove grime, stains, dirt, and more. Even better, once the stain is removed from the surface, the melamine foam absorbs the debris. Awhile back, there were some unfounded health concerns regarding the use of magic erasers because it was falsely reported that they contained formaldehyde. In reality, the ingredient found in magic erasers is “formaldehyde-melamine-sodium bisulfite.” Even though this contains the word “formaldehyde,” it is important to understand that this is not an ingredient and there are therefore no associated health risks with using a magic eraser. In fact, magic eraser products are completely non-toxic. Magic erasers are extremely easy to use. All you need to do is slightly wet the sponge itself to activate the melamine foam for maximum effectiveness. From there, scrub away at the surface that you want to clean. It can be useful to scrub in small, circular motions for the best results. Once you’re done using the eraser, wring it dry if it’s still wet. You may also want to leave it out somewhere to air dry. Most magic erasers can be used dozens of times before needing to be replaced. You’ll generally know when your eraser needs to replaced because it will begin to crumble and fall apart. Another thing to keep in mind when using a magic eraser is that the material is abrasive, so you’ll want to make sure that you’re not using it on anything that could be damaged by an abrasive cleaner. If you’re in doubt, it’s always a good idea to do a spot-test in an inconspicuous area. It’s a good idea to keep plenty of magic erasers around the house, especially when you consider how many different uses they have. While most people use magic erasers to get rid of scuffs on walls, there are so many other potential uses that can come in handy. When was the last time you were frustrated by trying to remove a sticker or label from a glass or plastic bottle? You probably didn’t realize that you can use a magic eraser to easily remove that annoying residue from stickers and labels. If your bathroom has a fiberglass shower or tub, you have probably also struggled to find a product that was effective in removing dirt and grime from the floors. A magic eraser can do a great job at removing stains from these types of surfaces. They’re also great for cleaning glass and fiberglass shower doors. Accidentally used a permanent marker instead of a dry-erase one on a whiteboard? Yep, you guessed it; a magic eraser can get rid of those stains as well. 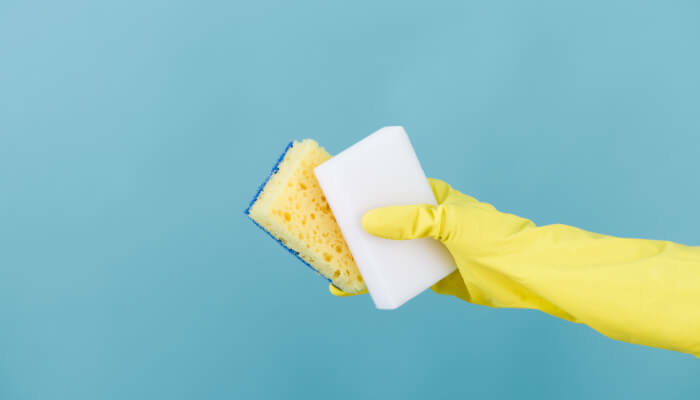 A magic eraser can also be used to clean everything from tile grout and stovetops to some countertop surfaces, shoes, and even the interior of your car. If you buy the “brand name” magic erasers, you’ve probably noticed just how expensive they can be. The good news is that you can save a lot of money by buying generic magic erasers instead. These are just as effective because they’re made of the exact same melamine foam. You can find these for a lot cheaper at your local dollar store or even buy them in bulk online. There are also steps you can take to prolong the life of your magic erasers, allowing you to get more use out of them and save money. For starters, consider cutting up your magic erasers into smaller portions rather than using the entire sponge at once. This will help you make each sponge go a lot further. Being sure to wring out and dry your magic eraser after each use will also help to prolong its life and prevent it from crumbling prematurely. Time To Hire A Professional House Cleaner? Magic erasers are a great item to keep on-hand with your cleaning supplies. Not only are they inexpensive, but they’re also extremely versatile and have a number of uses beyond removing scuffs from your walls. Magic erasers are also extremely easy to use and are non-toxic, so you can feel good about using them to keep your home looking its best. Speaking of keeping your home looking its best, perhaps now would also be a good time to consider hiring a professional house cleaning service. At Maid Sailors, we specialize in providing New York City and the surrounding areas with the house cleaning services they need to keep a sparkling clean living space. When you hire one of our certified professional cleaners, you can enjoy coming home to a spotless home without having to lift a finger. And when it comes to cleaning supplies (such as magic erasers), you can enjoy the convenience and peace of mind in knowing that our cleaners provide all their own supplies. At the same time, if there are any specific cleaning products you wish to be used, we invite you to leave them out and let our cleaner know. We would be happy to accommodate. We also offer green/eco-friendly cleaning supplies at no additional charge to you! Ready to book your cleaning or find out more about our many cleaning services offered? Contact the Maid Sailors team today; we look forward to helping you enjoy a clean home without the time and hassle of doing it yourself.